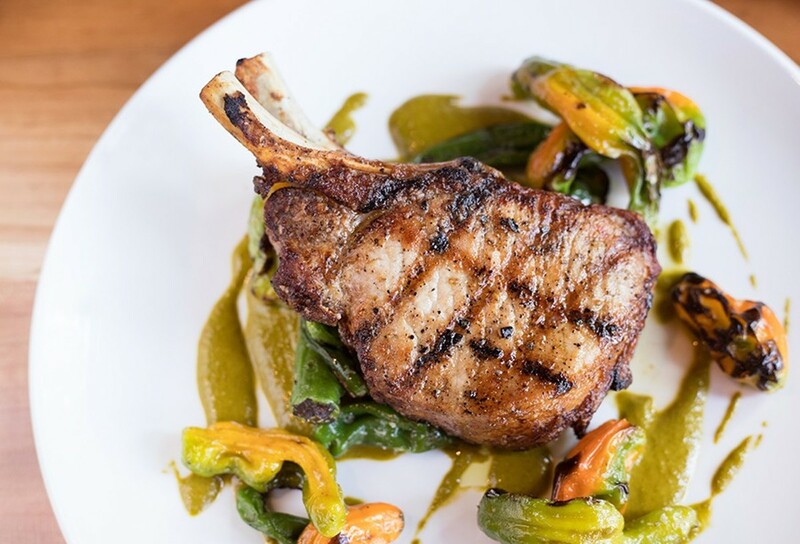 Louie's food is simply, but expertly prepared, as this pork chop with shishito and chermoula demonstrates. Reflecting on his restaurant career, Matt McGuire likes to paraphrase a Miles Davis quote. "You have to play an instrument for a very long time before you can play like yourself," he says. "I've always liked that." Yet it's almost shocking that someone with as impressive a résumé as McGuire feels as if he is only now coming into his own. If restaurants are his instrument, he's a virtuoso, having played a masterful tune at such esteemed establishments as Monarch, Brasserie, Central Table Food Hall, Herbie's and Niche Food Group, where he was director of service for all of Gerard Craft's restaurants. To say that he's been at the top of the city's restaurant game is an understatement — in terms of the front of the house, he is the biggest game in town. And none of it might have happened were it not for King Louie's. When McGuire opened the beloved restaurant in 1995, he was, in his words, just a kid, with little restaurant experience outside of cooking on the line while in art school in Chicago. He was lured into the business full time when some high school friends presented him with the opportunity to help them open a bar, and for a while, that's what King Louie's was — a college tavern for Saint Louis University and Washington University students who appreciated its almost secretive locale. 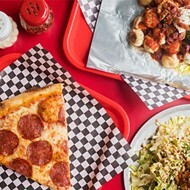 Tucked under a viaduct off Chouteau and 39th Street between South Grand and Vandeventer, King Louie's felt like an oasis in the midst of an industrial part of town. Head chef Sean Turner and owner Matt McGuire. Eventually, the college bar atmosphere gave way to that of a solid neighborhood tavern, which in turn transitioned into a bona fide fine-dining restaurant that played a crucial role in helping to shape today's St. Louis restaurant scene. King Louie's was so popular, it might still be open were it not for road construction. A two-year project virtually closed off access to the restaurant, confusing its customers and cutting business in half almost overnight. McGuire remembers his daughter talking about how cool it was to be able to skateboard across the vacant stretch of road that severed the restaurant from the rest of civilization. His response: "You don't know how uncool this is." A victim of the construction, King Louie's closed its doors in 2007. Though McGuire would go on to work in some fulfilling roles for great people, he still always had the urge to again do a project of his own. That opportunity presented itself last year when another institution, Jimmy's on the Park, closed, leaving its attractive space in the heart of Clayton's DeMun neighborhood in search of a new tenant. McGuire had always loved that area; in fact, its leafy environs were the one thing he always felt was missing from King Louie's, a place he often referred to as a "neighborhood restaurant without a neighborhood." A classic margherita shows Louie's way with a pizza. 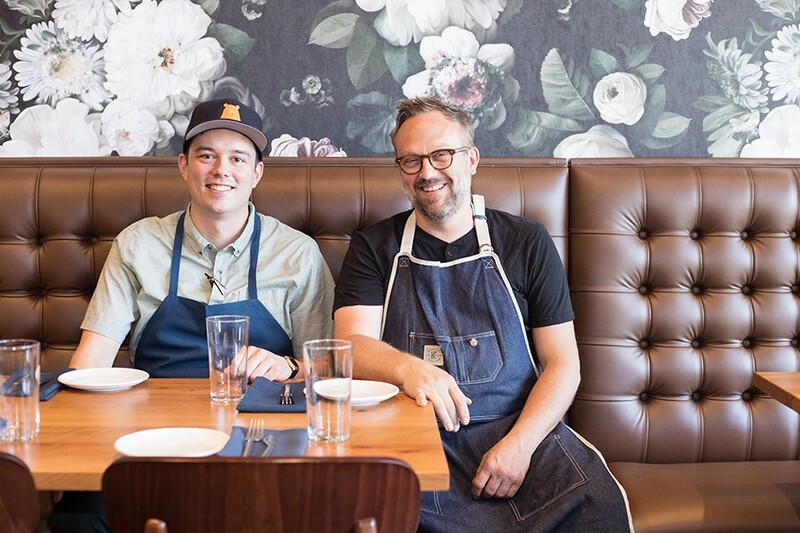 Perhaps that is why McGuire feels that the five-month-old Louie is the culmination of who he is as a restaurateur: It finally has all of the elements in place. From the food to the hospitality, the aesthetic to the neighborhood, all come together to create a complete dining package that is nothing short of joyous. At Louie, McGuire has created the sort of restaurant where everyone wants to eat — a factor that makes it an incredibly difficult reservation to score. 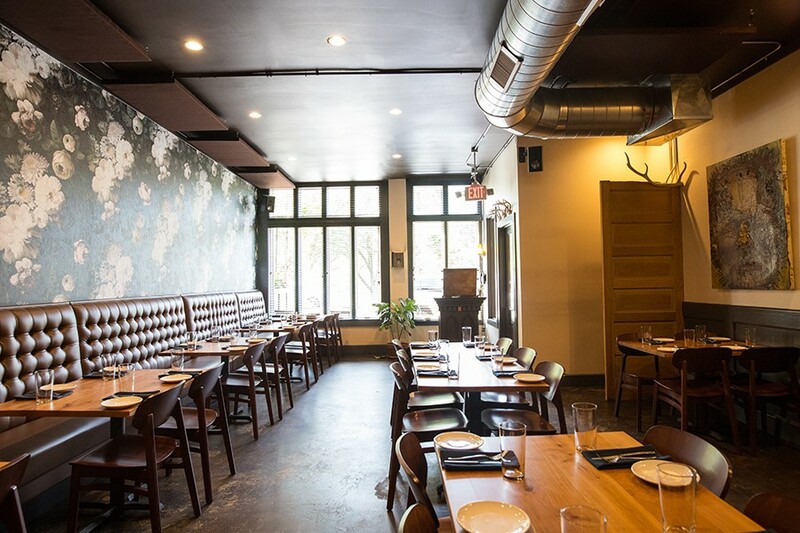 The small, shotgun dining room, simply appointed with wooden tables, exposed ductwork and a wall of striking, floral-print wallpaper, fills quickly. 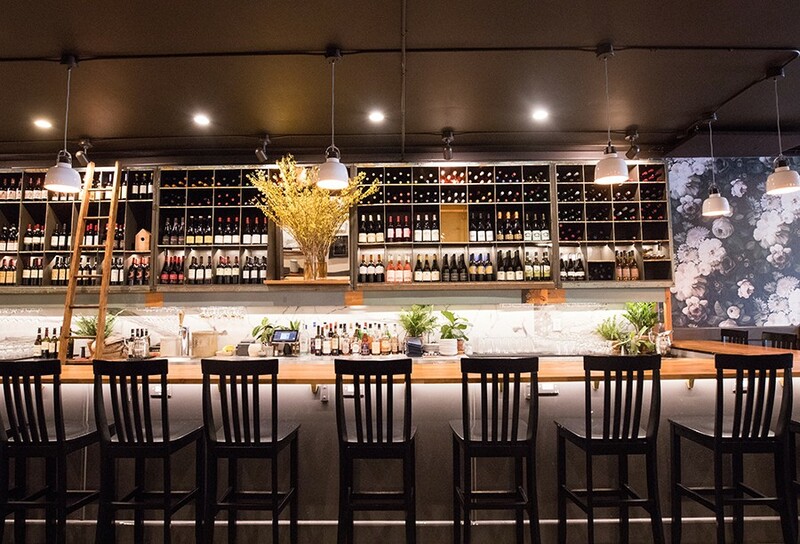 That's why McGuire decided to reserve its sizable bar for walk-in diners, something only a hospitality veteran can pull off without offending thirsty would-be imbibers. 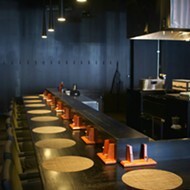 Seats at the bar are reserved for walk-in diners. If the dining room is lovely in its simplicity, the food is even more so. A relatively compact menu of Italian-inflected cuisine anchors the restaurant, thereby speaking to the confidence and prowess of McGuire and his team. Pizza, pasta and simple roast chicken provide little cover for mistakes. They have to be executed flawlessly — and they are. Much of the credit goes to executive chef Sean Turner, who worked with McGuire at Brasserie and Central Table Food Hall, then moved to New York where he cooked for Jonathan Benno, a Per Se alum. His menu is not comfort food in the mashed-potatoes-and-fried-chicken sense of the word. It's more like "comforting food." What could be more warmly satisfying than an appetizer special of arancini, the most authentic rendition of the Sicilian dish I have seen outside the old country? Spheres of risotto as big as tennis balls are fried so that the outside develops a delicate crust that yields to the creamy interior with just the touch of a fork. Ground beef, prosciutto and rich tomato sauce are a savory prize at the center. They are the perfection of the form. 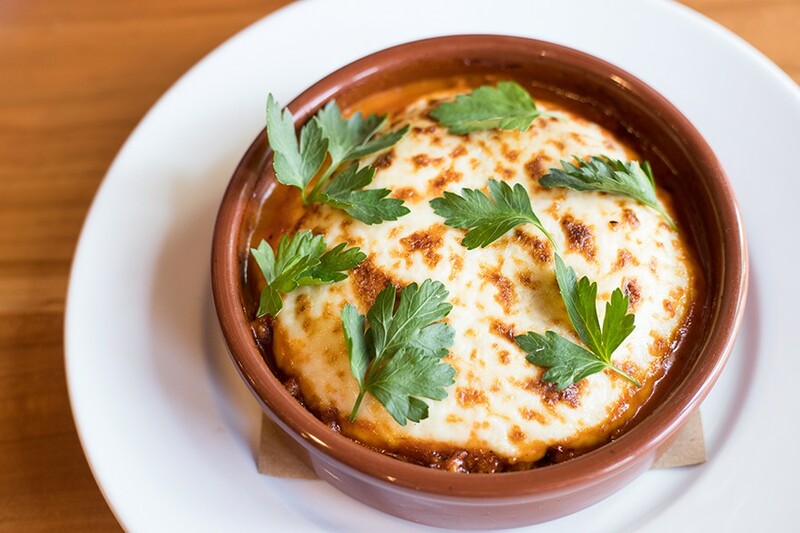 Roman gnocco is baked with pork ragu, bechamel and pecorino. Hummus is equally excellent, this version made from white beans and liberally spiked with fresh mint. The velvety spread begs to be slathered onto the accompanying wood-fired bread; its charred exterior adds a bitter component that combines beautifully with the sweet mint. Even a simple platter of prosciutto dazzles. Like the recently crowned Duchess of Sussex's wedding gown, something so straightforward and unadorned demands impeccable quality. The silken, rosy meat, interspersed with ribbons of buttery fat, is shaved so thin you can see through it. It melts on the tongue, pairing with the salty Parmigiano Reggiano as if they were made for each other. McGuire and Turner do nothing to this meat and cheese but source it and serve it properly, yet they prove that doing so can be an art form. Louie's menu contains just two pastas, a number that might seem small until you realize they leave you wanting for nothing more. Chitarra, a thick spaghetti-like noodle, is tossed with just a few simple ingredients: tomato sauce, basil, chile flakes and Grana Padano cheese. They are balanced perfectly, making clear why less can be more. 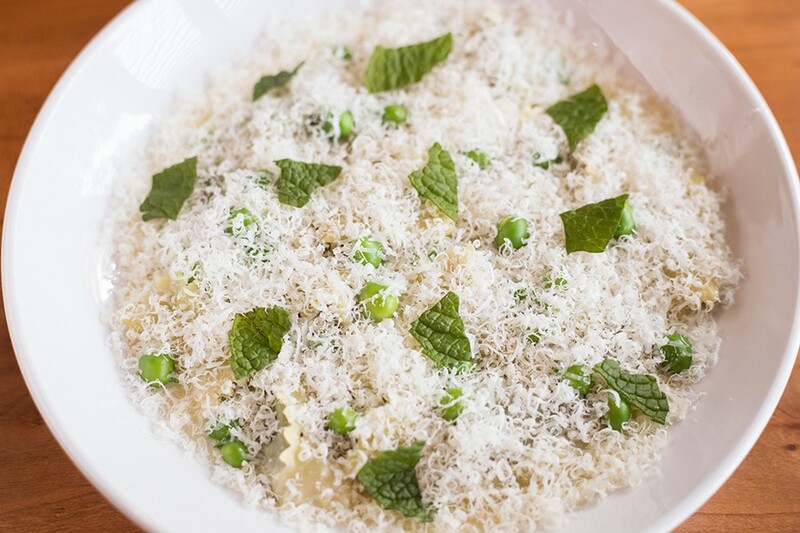 Agnolotti pasta includes spinach, ricotta, spring peas and mint. Agnolotti is no fussier, yet it's positively luxurious. Rectangular pillows of delicate pasta are filled with ricotta, spring peas and mint, then covered in a Grana Padano blanket that looks like a dusting of snow on a springtime garden. It's glorious. Pizzas follow suit, the key to their success being a crust that is nothing short of perfect. Neapolitan in spirit, the dough is naturally leavened, then well hydrated to stand the searing-hot oven. This results in a thick, springy exterior that is soft but has a nice amount of pull. 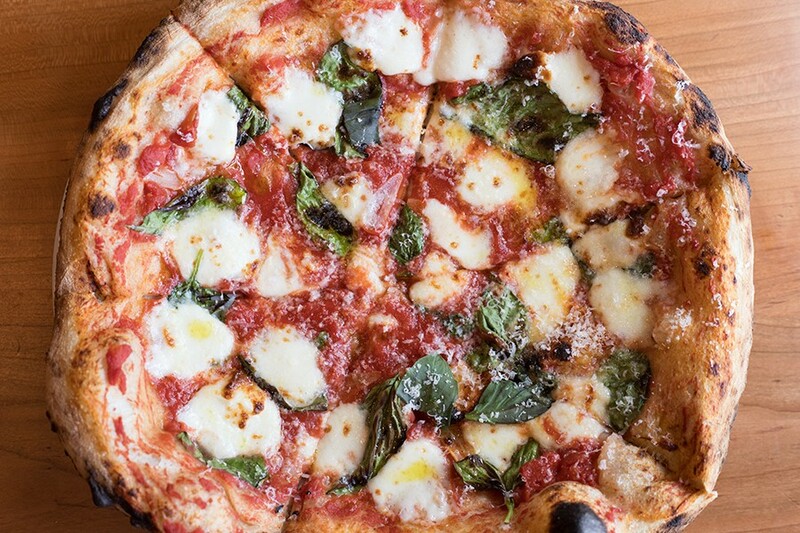 Char from the wood oven speckles the crust, an ideal canvas for a Margherita presentation. Crushed tomatoes, mozzarella and basil finish off what is one of the best renditions of the classic around. 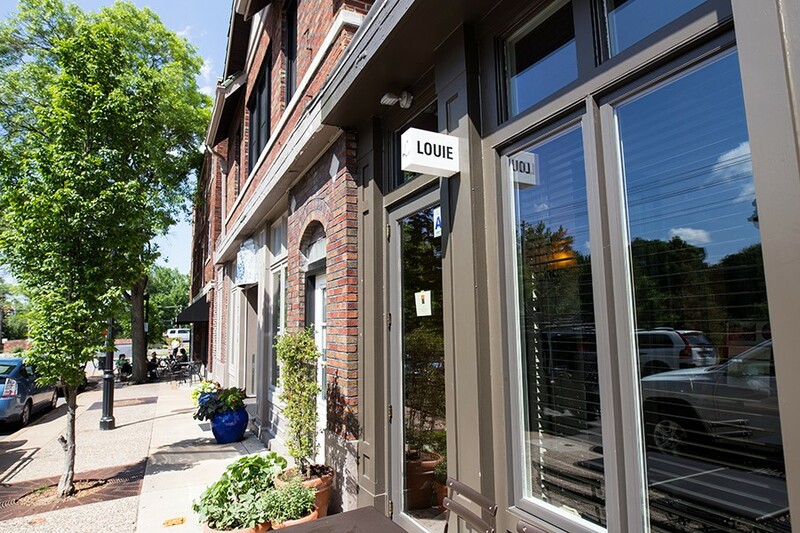 But Louie is not simply a pizza-and-pasta spot. Larger entrees excel, like a thick-cut pork chop that sits on a bed of chermoula, the coriander-forward North African-inspired sauce. 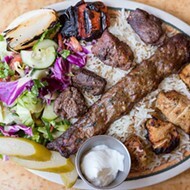 Charred shishito peppers surround the meat, adding a bittersweet snap to an already electrifying dish. The dining room's floral wallpaper provides visual appeal. Dorade, a light and flaky Mediterranean white fish, is served skin-on, its delicate flesh seared by the grill. A salad of farro, lima beans, preserved lemons and herbs makes you feel as if you are sitting in an Italian seaside trattoria, not the middle of the heartland. 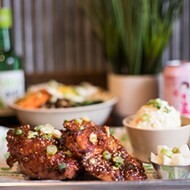 The roast chicken is perhaps the dish that is most representative of what McGuire and company want to achieve at Louie. It's nothing that we haven't eaten 100 times before: a brined and seared breast and thigh, served with the skin on and crisped. 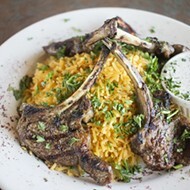 The meat is succulent; it doesn't need sauce, but an intensely savory pan jus deepens its flavor. It is a straightforward, uncomplicated dish, yet it's stunning. The reason it's so revelatory is not just a matter of flavor and flawless execution. You can screw up a roasted chicken (trust me), so those factors are laudable. However, what makes it taste so sweet is also about the spirit in which it is served. McGuire is known for genuine, empathetic hospitality, and every last person on his staff gets that. He wouldn't hire them if they didn't. The restaurant occupies the former home of Jimmy's on the Park. That chicken is delicious. I thought so; my daughter thought so. What was also delicious was the glass of orange juice she washed it down with. Our server, Jordan, had told us it was a beverage option. However, when he got back to the bar, he realized they were out. Instead of telling us no (which we would have gladly accepted), he went to the kitchen and hand-squeezed an entire glassful of juice in the middle of a busy service. You may see a roasted chicken on every other restaurant menu in town, but you don't see that sort of earnest commitment to taking care of people — notably a four-year-old who's not going to drop serious coin on a bottle of Brunello — everywhere you go. You can tell a lot about a restaurant in how the staff treats the least of its patrons. And it starts from the top, from a restaurant veteran who has come full circle to find his tune — one we all will be humming happily for years to come.